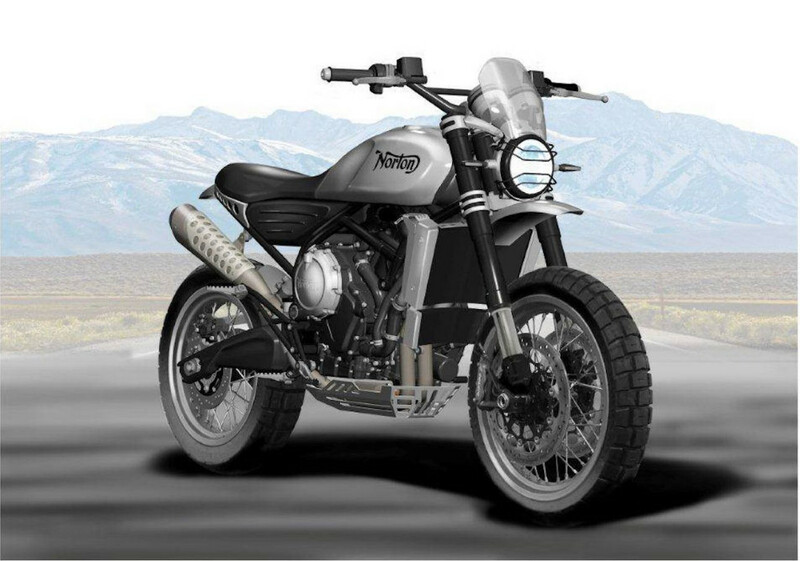 The ambitious plans of Norton Motorcycles include a 650cc parallel-twin Scrambler, which is depicted in new drawings issued by the company. At least one version of the bike will be very capable off-road, rather than a retro-styling exercise. A “street” version with lower spec is also expected. The engine is designed around a single cylinder bank from the 1200cc v-four also under development by Norton. Eventually, Norton expects to introduce a supercharged version of the 650cc twin for production models. Look for the Scrambler to make its debut in production form at the NEC show in Britain this Fall. Where’s the Benelli Leoncino? It is already in production and available elsewhere in the world for probably a whole lot less than this. By the time Norton gets their act together, the “Scrambler” fad may have seriously matured out and the buying-riding public will have moved on to something else. Plus, a lot of us “old-timers” remember the Wolverhampton-built Nortons as bikes that were not priced in the stratosphere. Excellent pointe, sir. That particular Benelli is quite the beauty. what is it with this craze for having such short seats? it looks PANTS. Not as bad as the CCM spitfire though. What’s slower (no pun intended), this Notrun “news” or the NFL offseason? 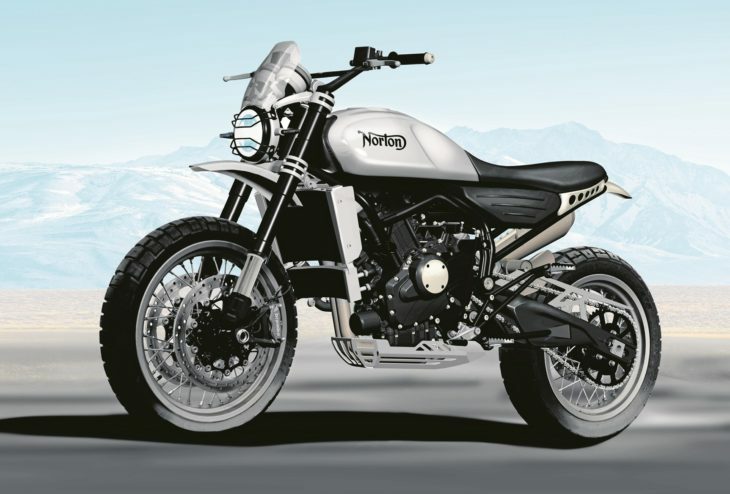 There is a much nicer looking photo of a real scrambler styled motorcycle on the Norton website. This does not say Norton to me. Interesting, right foot shifter noted. Nice job. Quite impressive for a small company, the Commando’s are expensive but not entirely over-the-top. Not sure how the 650 can compete against things like the 765 Street Triple for the roadster version, the Scrambler looks somewhere between silly and odd for road use but, hey, that has not stopped other manufacturers shifting similar products. Don’t they have a tie up with an Indian company, British design and tech being used to produce some neat products for the mass market there. Perhaps the motorcycling equivalent of “vaporware”? Regardless, it will be expensive to buy, insure and maintain. The dealer network will be like Hobbits. Small and in need of a wizard just to stay alive. When it comes to what were without question the most popular bikes of the 60s and 70s, i.e., Scramblers, Honda, Yamaha, Kawasaki and Suzuki all have a storied history of their own to sell us. I should think that if those guys took the time to make them affordable and authentic, albeit with modern technology and features, then folks who remember the “nicest people” and are ready to “let the good times roll” )to name but two effective ad campaigns) will become the finest spokesmen for what should be today’s motorcycling. 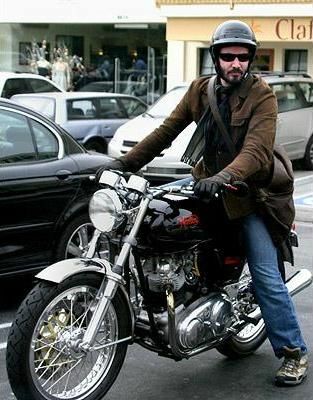 No one needs a motorcycle. Everyone however, could use a smile. Motorcycles used to do just that. Between the silly scowls of the HD and their wannabes on Starleys and the like, the Speed Racers on their sportbikes, the old farts on their Wings and Glides and the Adventure motorcyclists pontificating at Barstucks, no one is smiling. Posing, yes. Smiling, no. I generally agree. But I am smiling these days on my G310R. Light and simple is smiley for me. I am also smiling on my XSR700 – also light and relatively simple roadster. Recently sold my main ride for last 16 years – 2002 R1150GS. 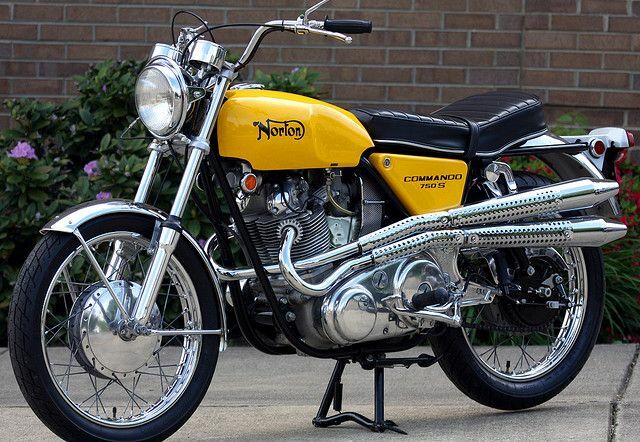 The most successful NORTON would be a repop of a Commando that doesn’t shake itself apart. Get rid of the shake and rattle but leave the roll. Didn’t they already repop that one? My bad. It looks like they are producing Nortons at about 18k a pop. I wonder why they bother with the Norton name. The bike is probably desirable. I wish them luck. PS, the radiator looks like a liability for intended environment. Reconsider please or, armor it. The images seem to be computer generated. Cannot tell if they put screens over the water and oil radiators which are unprotected by tire mudguards, per modern style. Please relocate coolers to the rear. That was figured out decades ago, by an Australian of notable fame. Name starts with B.
Britten may be regarded alongside classic British best-bikes. World leading design, no way to manufacture and bring to market. I do not get what this is best att. WHY?? Sometimes you got throw in the towel, your time in the spotlight has come and gone. Phil Schilling, “Cycle” magazine 1974. Homage to Norton twins..
Who here actually believes Norton will produce a competitive bike at a competitive price? Not to mention having a decent dealer network and acceptable replacement part availability? Show of hands? I was surprised to read that a production format will be on display this fall. I wouldn’t have guessed they would be that far past the pipe dream stage. Then I also thought Norton would be shuttered by 2020, but I guess they are doing well enough to pour some serious money into development. Or maybe I missed the news flash where some deep pockets from China or India bought the company? Motorcycle news is so slow these days, I actually clicked on this. I hear ya. Heard anything about 2019 Hayabusa? That would be interesting.